Microsoft has made an important and powerful update to the Outlook.com platform that allows you to save email attachments directly to your OneDrive folder. The update was quietly rolled out to some users over the weekend but is now available to all users and is a powerful step forward for the online email service. again speaks to a well throughout design from the Redmond company. 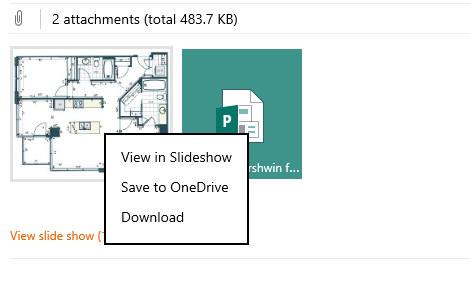 When you save attachments from email in Outlook.com to OneDrive, they are stored in a new Email Attachments folder so you can quickly and easily find them later. The power of this feature should not be under estimated. It is great if you are on-the-go and are triaging email online but need or want the attachment quickly later in the day. Also think of times when you are using a public computer at a library, airport or hotel. Now you can see those attachments and save them without ever having to worry about having personal content (which is often blocked) on those PCs. I’ll point out the obvious but you probably know this already. In order for this feature to work your Outlook.com and OneDrive ID have to be the same (which they probably are anyway). That means that if you are using OneDrive for Business under a different ID, you won’t be able to do this (yet). By-the-way, if you want to attach a file from OneDrive to an outgoing email, you can’t do that with the file itself (again, think public computer). You can however send a link to that file on OneDrive for your recipients to click and download directly.